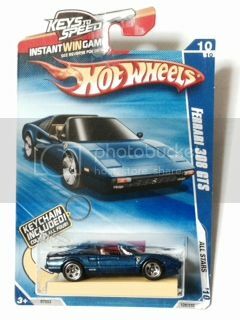 Description: 2010 Hot Wheels #128 Ferrari 308 GTS with Key Chain,Mtflk. Dk. Blue, w/Ferrari emblem on sides & hood, Black Malaysia Base, w/5SP's,MOMC. Payment/Shipping Policy: Ship to most locations in USA,1st Class @ listed price.BUT Shipping MAY BE ADJUSTED DUE to QTY.,SIZE or LOCATION. (Canada/International will be higher)!! **Note**"If YOU REQUIRE" a D/C# on 1st Class you "MUST REQUEST IT" in "Comments Section" & "ADD $1.00" to SHIPPING! I WILL SEND A INVOICE,"Please Wait"!! PAYPAL DUE WITHIN 48 HRS.MONEY ORDERS DUE WITHIN 7-10 DAYS OF PURCHASE.SHIPPING DISCOUNTS ON MULTIPLE PURCHASES "ONLY" WHEN MAKING "ONE" PAYMENT!! Please Contact for Shipping quote outside of the USA!! (Canada/International will be higher)&(Their is a $3.00 fee for Customs Form & a (3%)Extra Charge on International Shipping.